The Apollo program used a rocket series named Saturn V. These behemoth launch vehicles hold the record for being the tallest, most powerful and only rockets to get humans out of Low Earth Orbit (anything higher than 2,000 km; your average jet liner flies at 13 km). To put numbers into perspective, my Ford Focus weighs about 1,100 kg (2,425 lb), an NFL field is 109 m (360 ft) long, and you require 9.8 Newton (N) (2.2 pound force) to lift 1 kg (2.2 lb) at the earth's surface. The moon is approximately 384,000 km from us. The Saturn V is a staggering 110 m (363 ft) tall - laid it on its side it's 3 feet longer than an NFL field. It weighs around 3,039,000 kg (6,699,000 lb) when fuelled up. 3039 tons to get to the moon. 2762 Ford Focus. 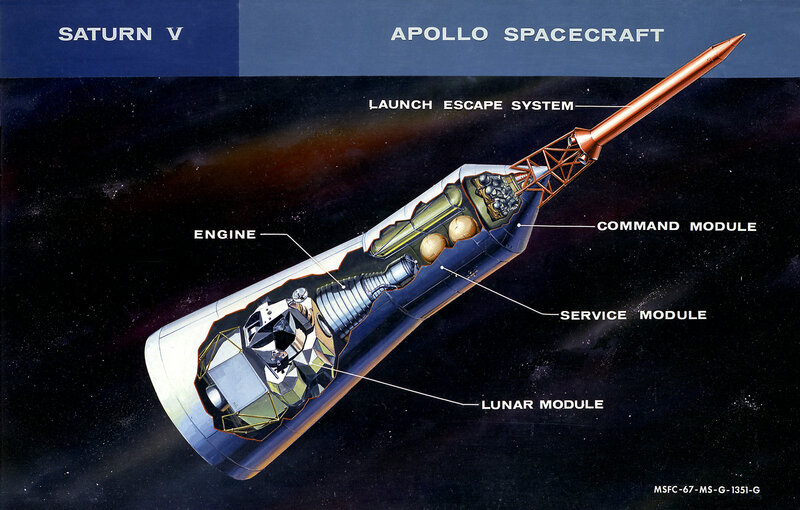 The actual payload of the Saturn V during the Apollo program is the Apollo spacecraft that consists of a Command/Service Module (CSM) and a Lunar Module (LM). These compartments house the astronauts during the mission, land them on the moon, and bring them back to earth. The CSM and LM, in comparison to the Saturn V, are incredibly small. The CSM is about 11 m (36 ft) tall and weighs 5,809 kg (12,807 lb); the LM is 5.5 m (17.9 ft) in height and weighs 4,547 kg (10,024 lb). For simplicity's sake we can declare that the payload of the Apollo program weighs 10,356 kg, let's round up to 11,000 kg (24,250 lb). It is around 16.5 m (53.9 ft) tall. That's 10 Ford Focus. To summarize. Fill 2762 Ford Focus full of rocket fuel, light them on fire and 10 end up on the moon. I'm confusing myself. But really, to get humans to the moon we need about 11,000 kg of equipment with an approximate height of 16.5 m. Our launch vehicle, the Saturn V, is nearly 7 times taller and 11 times heavier. Let's have a look at the ludicrous force the Saturn V produces. It is a three stage rocket, meaning there are three separate ignitions that occur. Once a stage burn is complete, it's shed and tumbles back towards the Earth. Remember, gravity and air friction require an incredible amount of energy and force to overcome. The first stage (S-IC) - the F-1 engine powered stage that Jeff Bezos is trying to recover from the bottom of the ocean - is 42 m (138 ft) tall and produces 34,020,000 N (7,648,000 pound-force). It burns for a grand total of 2 minutes and 41 seconds, after which it's disconnected and left to fall to the ground. We've successfully lost about 2,300,000 kg (5,000,000 lb) - over half our weight just to get up to 68 km. That's a fuel efficiency of 4 cm / litre (5 inches per US gallon). After we've decoupled stage 1, stage 2 roars to life. The second stage produces less thrust and is not as tall. We've already overcome 68km of the earth's gravitational field, we've shed over half our weight, and now don't need as much thrust to move our remaining weight. So, our second stage (S-II) fires up and produces a fifth of our initial thrust 4,400,000 N (1,000,000 pounds-force). After about 7 minutes stage 2 is burned out, and we have shed another 436 Ford Focus of weight. 480,000 kg (1,060,000 lb). This stage is 24.8 m (81.5 ft) tall. The third stage (S-IVB) is only 18.8 m (61.6 ft) tall and weighs 120,800 kg (266,400 lb) - 109 Ford Focus. This third stage inserts the rocket into a stable orbit around the earth, and after proper insertion waits for the second burn to propel it on its course towards the moon. These two burns are combined about 8 minutes in duration. After the first burn, we are now in an orbit at 191 km (118.8 mi) and travelling at 28,054 km/h (17,432 mph). Remember Low Earth Orbit ends after a height of 2,000 km. We're currently 0.0005% the way to the moon. Once we've burned through stage 3 we can eject it, which leaves us in control of our CSM and LM spacecraft. The problem being, that at stage 3 ejection, we are high enough that earth's gravity is a fraction of what we're used to, it would take months, even years, for stage 3 to fall back to the ground. Several early Apollo missions aimed staged 3 into the sun, later missions crashed it into the moon. The main reason is to remove any danger for future missions, as a floating stage 3 in an earth or lunar orbit would be a space junk hazard. To conclude. To get to the moon we require an insane amount of force and energy to get into space. Once we're in space we can move around easier (less gravity and friction) and don't need as much to get us to the moon. To get to the moon we've separated our weight in several stages from over three million kilograms to just under 11,000 kg. In the process we've burned over 2,800,000 kg (6,172,943 lb) of fuel. And we've reduced the height of our rocket from 110 m to just under 17 m. 85% of our rocket is intended to get us to the moon. I encourage everyone to rethink, just for a moment, what an insane amount of engineering has gone into creating vehicles that can take us to the moon. And, for the betterment of all man-kind, to become interested in the science behind the process. Inform yourself, stay interested, encourage science. Talk to your Member of Parliament (or whoever represents you in your body of government) and encourage them to keep science funding in place. I am quite proud to currently be part of the University of Saskatchewan's Space Design Team (USST). We are in the process of designing a nano-satellite for the Canadian Space Design Competition. I am co-lead for the Command and Data Handling team, which controls the operations of the satellite. For more information - or your chance to name the satellite - head over to usst.ca. Images are courtesy of Wikipedia.